I work with horses of all ages and breeds, performing in all disciplines, from racing to dressage, show jumpers to hunters, event horses to pleasure horses, valuable young thoroughbreds destined for the sales ring, and foals. My approach is wholistic. When I come to a horse for the first time, I look at and consider their teeth, their feet, their feed, the quality of their living environment, and saddle fit if appropriate. All of these factors contribute to the horse's wellbeing and performance. When advisable, I refer clients to a specialist. The active horse is under continual stress - emotional as well as physical - and when one part of the horse's body suffers an injury, it can create chronic compensation, pain, and stiffness in other areas. 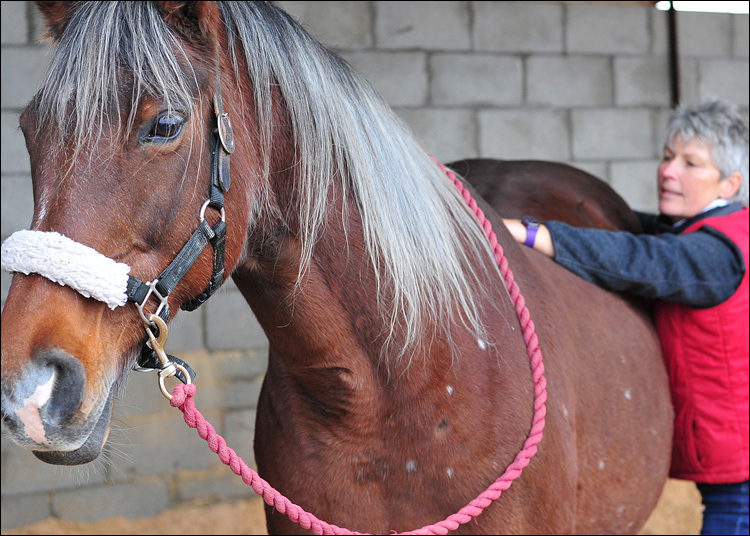 Horse behaviour can be greatly affected by pain and discomfort, often making the horse argumentative, agitated, or just acting out of character. Relaxation is key to reducing stress in the body. My aim is to help that horse, pony, or foal to achieve their highest level of potential in whatever discipline they work, whatever their stage of life. 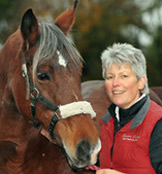 I specialise in equine muscle release therapy, working with several techniques, all of which address the horse's soft tissue, fascia, and muscles. Central to my practice is the modality Equine Touch. This gentle, holistic form of bodywork releases restricted fascia and hypertonic muscles, improving blood and lymphatic circulation, boosting the immune system, reducing pain and anxiety, and encouraging a greater range of movement. I gauge areas of restriction in the horse's body through muscle diagnostics, gentle manipulations, and stretching exercises. Using a combination of muscle release, stress point massage, energy balancing, acupuncture, and photonic red-light therapy, my work improves not only their range of motion, but also their general sense of wellbeing, temperament, confidence, appetite, hair coat, skin, and willingness to work with you. I started riding at four years old, had my first pony at eight, and was participating in show jumping, hunting, show classes and cross country from that age into my twenties, when I went to northern Italy and rode in a show jumping yard. Unfortunately, I got injured and had to cut short my work there and return to Ireland. During my teen years, every weekend and during school holidays, I worked with the Daly brothers, near Tallow, Co Waterford, helping them break in young horses. They were known for their success in training difficult horses and I would frequently be seen riding a bucking horse on the manure heap or in the bog up the hill, until they calmed down! After I came back from Italy I took a break from horses and travelled widely during my twenties. At thirty I settled back in Ireland, and bought a pub in my home area, in the heart of point-to-point country; on the east Cork-west Waterford border, just outside of the town of Tallow. I bought myself a thoroughbred mare, by Sheer Grit, who after doing some hunting, show jumping and point-to-pointing, became the original brood mare of my breeding mares and passed on her best qualities and abilities, along with her competitive, no-nonsense, willing nature. I moved to County Clare in 2001, and in 2004 began studying human Feldenkrais work, Awareness through Movement with Bernie Kenny in Ennis, who encouraged me to check out TTouch and TTeam, which is the adaptation by Linda Tellington Jones and her sister Robyn Hood of human Feldenkrais work into a format that works for horses. I went on their website, printed off a few pages detailing the technique, went out to the stable to Belle, and proceeded to try my hand with their ttouches. What astounded me was the mare dropped her head to the floor and shook for 30 minutes. I then just HAD to learn more! 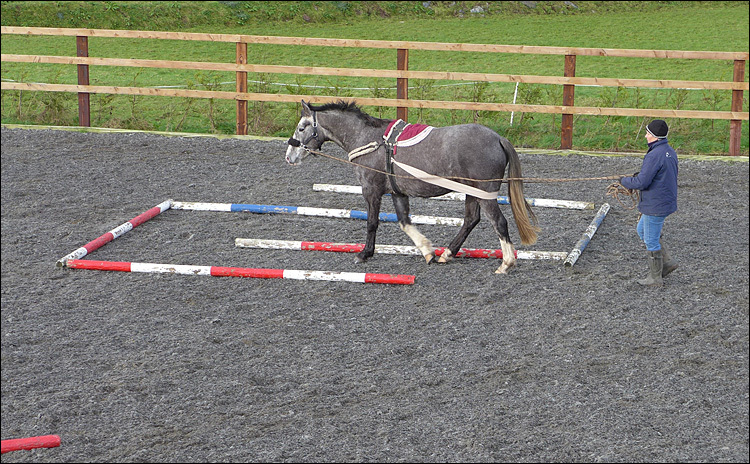 This was the beginning of a huge shift in my learning and approach to how I handled horses. With every new technique I study, I find another door opens up, and brings me to a deeper level of understanding how the horse functions both mentally and physically- long may the learning continue! During the course of my training to become an Equine Touch practitioner, I had the good fortune to attend a 3-day, whole-horse dissection course with Ivana Ruddock whose knowledge of equine biomechanics, anatomy, and physiology, is astounding, and much of which she generously shared with us. My trainings with both Dr Kerry Ridgway and Klaus Schoneich are continuing. An ongoing study with Dr Ridgway is his take on acupuncture, which has gone from traditional acupuncture to focusing on the connection of needling specific acupuncture point on meridians in painful areas to the release of large areas of tight fascial chains on that part of the horse's body; he is also a leading expert on the diagnosis and treatment of equine ulcers. Klaus Schoneich's work focuses on straightening the crooked horse. Every horse favours either going to the left or to the right, like us humans being left or right handed. This favouring of one side creates crookedness within the horse's movement. Until you get the horse to work equally they cannot have an upward swinging back - thus creating major strain on their joints and limiting their longevity. Carrowgar Stud, Quin, County Clare.